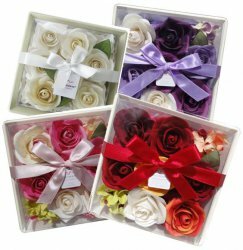 Beautifully crafted and scented handmade roses in clear box with square white wooden display dish attached. Giftpacked with ribbon and tag. Four colours / fragrances: Red - Rose, Pink - Orchid, Purple - Lavender, Cream - Vanilla.